Named after its chronological release order, "X" was certainly the most ambitious electronic record of its time. This massive double album (originally 2x60 minutes, 2x80 minutes for the 2005 Revisited Records Edition) attempts to marry the stretched Berlin School schulzian soundscapes with classical music. Subtitled "Sechs Musikalische Biographen", this tenth opus consists in six pieces, or biographies, each one evoking an artist or intellectual who inspired the German musician. Some tracks incorporate classical instruments, such as cello and violin, and even an entire orchestra, the "Orchester Des Hessischen Rundfunks". It should be noted that Schulze already manipulated the recordings of a string orchestra in his 1972 debut "Irrlicht", resulting in eerie drone landscapes of desolation. However, this time, the symphonic parts are not modified. Musically speaking, the electronic parts borrow the extended static impressions of "Timewind" as well as more melodic and percussive elements in the vein of "Moondawn" and "Body Love". When we think about it, the symphonic genre is perfectly suited to Klaus' universe and compositional style. After all, he always had a great admiration for the classical composers ("Timewind" was a tribute to Richard Wagner). Therefore, this mixture of genres was an unavoidable exercise for him. With VANGELIS, Schulze was maybe THE 70's electronic artist for such an experiment. Nevertheless, great ambitions does not necessarily make constant quality, especially during two hours of music. 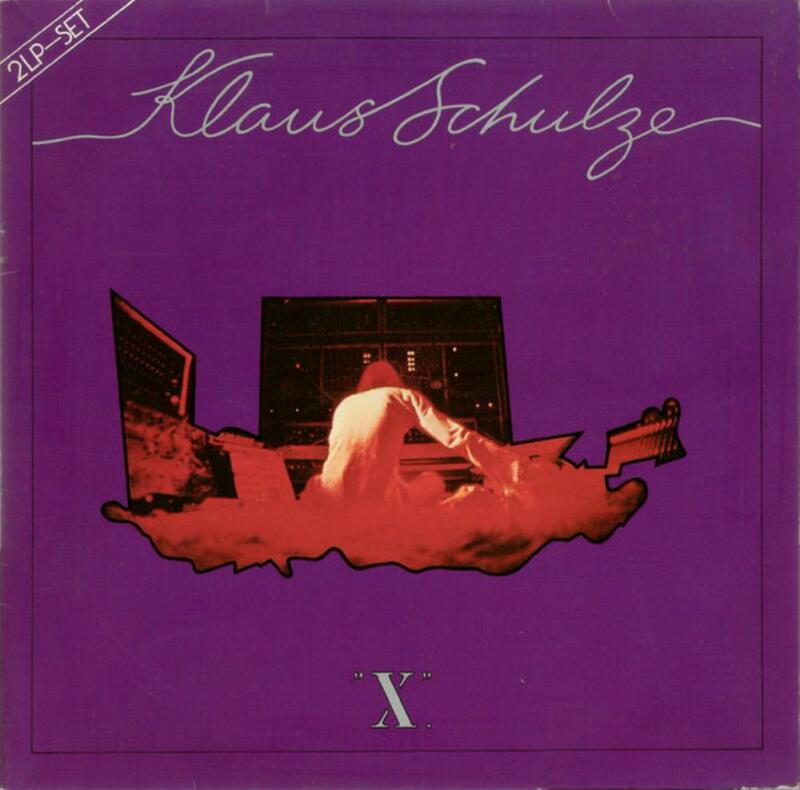 So, didn't Klaus Schulze went too far with "X"? Disc 1 is still rather dominated by synthesizers. After its ambient contemplative opening, "Friedrich Nietzsche" mixes Harald Grosskopf's percussions, a superb chorus, electronic loops and trippy synthesizer soli to create a slowly evolving, immersive and melancholic soundscape. You travelled through the cosmos to land on a deserted extraterrestrial landscape. One of Schulze's greatest compositions from the seventies! The next two biographies are only ones not including classical music elements. "Georg Trakl" was an Austro-Hungarian poet. This cool piece is a short, calm and mysterious interlude, resembling a little TANGERINE DREAM's hazy style. Klaus was also a science fiction fan: Frank Herbert is the only personality of "X" not of German culture. The track starts with a dark and pulsating sequence in the vein of a TD soundtrack. The result is even more futuristic than Schulze's next album, "Dune". Nonetheless, there are hardly no changes at all during these 11 minutes. Wilhelm Friedemann Bach was a German composer from the family of Johann Sebastian. His musical biography differs slightly from the others of the first disc, as this is the first genuine track to marry classical and electronic music. The atmosphere is tragic, thrilling, reinforced by B. Dragic's frightening solo violin interventions and strange sound effects. An anguishing nightmare when you're in a maze dating back to the Renaissance, trying to escape from an invisible threat. The ending is quite chaotic and enigmatic. 4 stars. Disc 2 incorporates more classical music elements, but is unfortunately less inspired. In collaboration with an orchestra conducted by Wolfgang Tiepold, "Ludwig II Von Bayern" is the composition where the marriage of Schulze's electronic soundscapes and the symphonic style is the most successful. Using a passage from Vivaldi's 11th concerto in D minor for two violins, cello and strings, it exposes the German artist's admiration for the great classical composers. Supported by a fast synthesizer loop, the first third is superb, elegant and epic. Magic! Nonetheless, this refined musical sculpture only lasts the first ten minutes. The second third is difficulty understandable. An uninteresting and repetitive orchestral passage, sounding as if the record was broken. Was Klaus' part forgotten in the final mix? The last section just recycles the theme from the first third. In fact, this track could have been shortened to its 10 first minutes. Named after a German writer, "Heinrich Von Kleist" features Wolfgang Tiepold at cello. This slow piece is mainly ambient, calm and melancholic, even experimental at times. The problem is that, except the contemplative chorus, nothing really happens during these 30 minutes, which finally become rather boring. 2 stars. The 2005 Revisited Records Edition is not very essential. The bonus track, "Objet d'Louis", is a poor quality recording of a 1978 performance of "Ludwig II von Bayern", with an orchestra. The reissue also features the original 26 minutes version of "Georg Trakl", rather monotonous. Ambitious, uneven, daring, however undoubtedly original, "X" is a colossus containing both gorgeous musical pieces and less interesting moments. A controversial release, some will love it immediately, others won't enter this beautiful and nightmarish world at first listen. I personally find this tenth offering a little overrated, but this fusion of electronic and classical elements had to be tried. If "X" had been a single album, consisting in the first disc with the first 10 minutes of "Ludwig II Von Bayern" replacing "Frank Herbert", then it would have been a masterpiece. As you may understand, this double symphonic opus is not very accessible and definitely not the one to start with for newcomers. However, this ambitious effort remains essential for anyone wanting to explore Klaus Schulze and progressive electronic. After all, the marriage with classical music is not that common in this genre.